Where The Golden Sands Resorts epitomises the laid-back beach style and the Parkroyal offers a more sedate, calming atmosphere, the Hard Rock Hotel specialises in a party, all-out fun time for all the family. Casual and laid-back styles are the order of the day as hotel ‘crew’ casually dressed in Polo-tees and beach shorts ensure that everyone has a good time. The initial view the Hard Rock Hotel of Penang retains the original ‘art deco’ facade from it’s time as the Casuarina Resort although with the use of generous feature highlights, such as the perpetually white ’King of Pop – Michael Jackson’ statue (below), you may be distracted from admiring the building’s form and it’s narrow vertically elongated windows (above). Arriving at the Hard Rock, you cannot help but be taken in with the vibe and the buzz of the place. Strategically placed thoughtful quotes and sayings are painted on walls and various placed around the resort. Music remains at the core of it’s design and you are reminded of this throughout the resort with it’s numerous collectibles and wall hangings from the busts of the Beatles to the larger than life hangings of sparkly shiny stage costumes. Where the Hard Rock Hotel Penang really shines is in it’s outdoor facilities; in particular it’s free form pool with it’s extremely large water play area and water slides. Walking through the hotel to the outdoors, you are immediately immersed in the sense of fun that permeates through the atmosphere. Walking across a wooden platform ‘bridge’, the pool starts the moment you step out of the hotel building, artificial sand surrounds the whole area and is even filled in, in some of the shallower, smaller pools. The deeper pool stretches across the width of the hotel, with rooms on the ground floor opening up directly in to the pool for that extra special, fun on your doorstep experience. The rest of the freeform pool is a mix between shallow sandy banks, perfect for toddlers and younger children and the slightly deeper pools for exiting the slides. The water play area, complete with self-filling buckets, gigantic shower heads, monkey bars, covered and open slides promises full days of fun for kids and adults alike. There are also a range of organised activities for guests to participate in throughout the day. The pre-requisite resort gym at the Hard Rock Hotel is complete with cycling and running machines, a range of bench presses and an array of weights. Overlooking the pool, it provides a great vista for guests who want to work out while on holiday. The Rock Spa takes the idea of music for well being to another level. The Rhythm and Motion spa offers an alternative music (speakers) based experience in which your body is literally bombarded by sound waves as you lie on a range and variety of speakers and allow their vibrations to permeate in to your body. The traditional types of massages and spa treatments are also available in the spa bungalow or in the private villas by the beach. These include the Hard Rock massage, Hot Rocks and Stereo massages. Also available are body wraps, scrubs, facials, pedicures and manicures. For fans of rock music, Hard Rock Hotel offers the opportunity to mix and produce your ‘own sound’ with the complementary MIX amenity. With a DJ mixer and a dedicated iPad, you’ll be able to create and mix your own range of music and take it home as a souvenir of your stay. The Roxity Kids Club caters to children between the ages of 4 to 12. With a music focussed theme and a range of imaginative characters, visitors to Roxity Kids Club are engaged in a variety of activities to keep them occupied during their time there. Tabu Teens Club offers teens the opportunity to connect with others in a similar age range, whether it’s just hanging out indoors with a game of foosball or pool, watching a movie in a ‘private’ cinema or playing one of the many game consoles available. For the music-focussed teen, there’s also the opportunity to experiment and mix tracks and music. Hard Rock Hotel succeeds here in allowing slightly older, more reluctant teen to spend their holidays with their family and parents but with the ability to be somewhat independent. 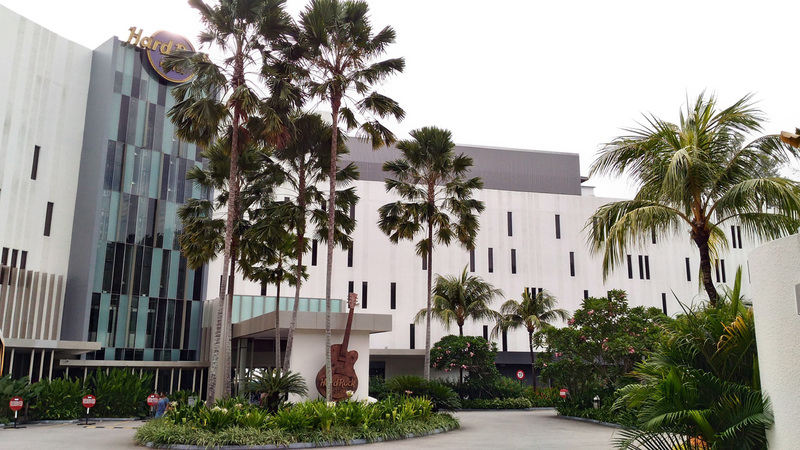 The range of memorabilia at the hotel is significant and impressive ranging from autographed guitars and drums to stage costumes and some of the instantly recognisable clothes worn by rock stars during their hey days. Hard Rock Hotel is the perfect destination for families looking for a fun-filled, busy holiday. The range and number of activities with which you are able engage and participate in, ensures that entire days are filled without even having to leave the resort. Fans of Rock would also thoroughly enjoy immersing themselves with the range of memorabilia on display and the chance to get up, close and personal.